The Grange Mercantile Association was organized by Issaquah Valley Grange No. 581 in 1916 and built this warehouse with large-scale ice-box and refrigeration rooms for general merchandise. The Mercantile Association served the food needs of the Issaquah community for 55 years before closing its doors to economic pressure in 1972. Clem Stefani (youngest son of Frank Stefani) was the last Chairman of the Board. The Grange Mercantile had been in business for 55 years. 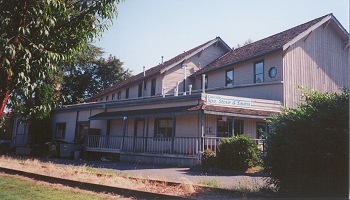 The upstairs of the building was used as a meeting hall, dance hall, and banquet facility during the years of the Grange Mercantile business. In the 1970’s, the building housed a whole mall of boutique-type shops. According to 1986 article in the Issaquah Press, at that time, it housed a gymnastics school, preschool, weight lifting and other fitness businesses and a dry cleaning outlet. The overall shape of this wood frame structure is a polygon that is composed of a long, rectangular two-story building with a one-story wedge-shape addition that fills the building site. The site is defined by the railroad tracks running at an angle immediately adjacent. The roof of the main building is a medium pitched side gable with five wooden, triangular brackets at each gable end. 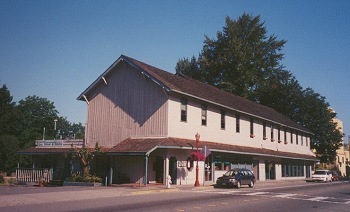 The original cladding of the building is still visible at the second-story level, but has been replaced with vertical groove plywood at the base and second story. The second story has large, vertically oriented one-over-one double hung windows with plain trim surrounds; these remain unaltered over time. The windows at the street level have been replaced with storefront windows and doors. Newspaper article from October 20, 1971. King County Tax Assessor records.